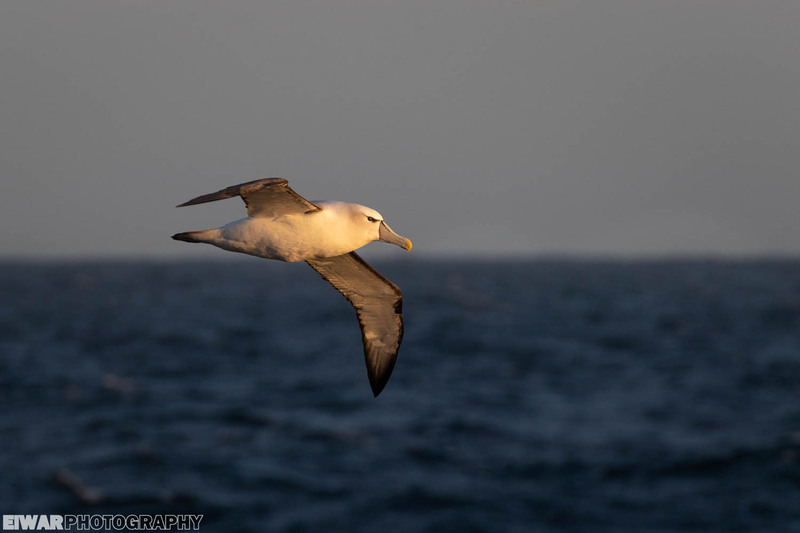 As you know if you’ve followed this blog these past weeks, I spent two weeks in November aboard a ship for a cruise-expedition to the subantarctic islands of New Zealand and Australia. 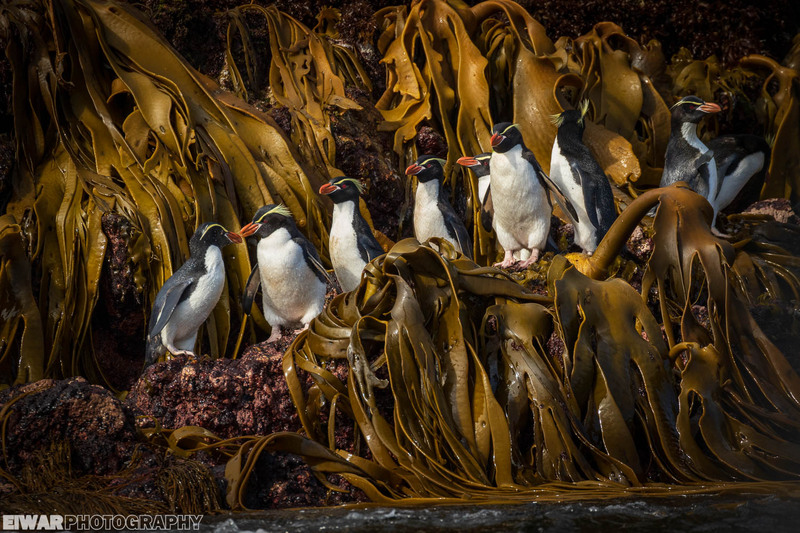 50 tourists, 9 staff members and 30 crew members, we embarked in Bluff, at the bottom of New Zealand, and visited several island groups scattered around the Southern Ocean for a voyage of discovery to none the same. 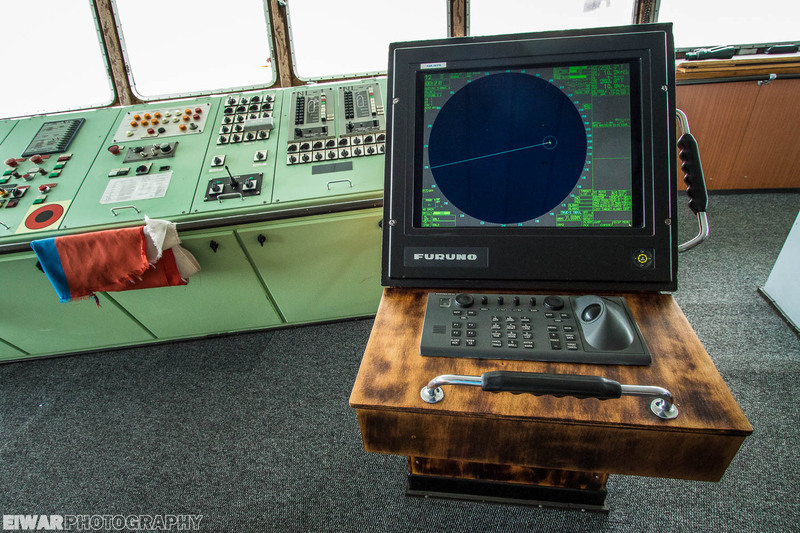 Built in Turku (Finland), our ship was originally named Professor Khromov, when she debuted as a research vessel for the USSR in 1984. A few year later, the Union collapsed, and several vessels became available for leisure purposes. 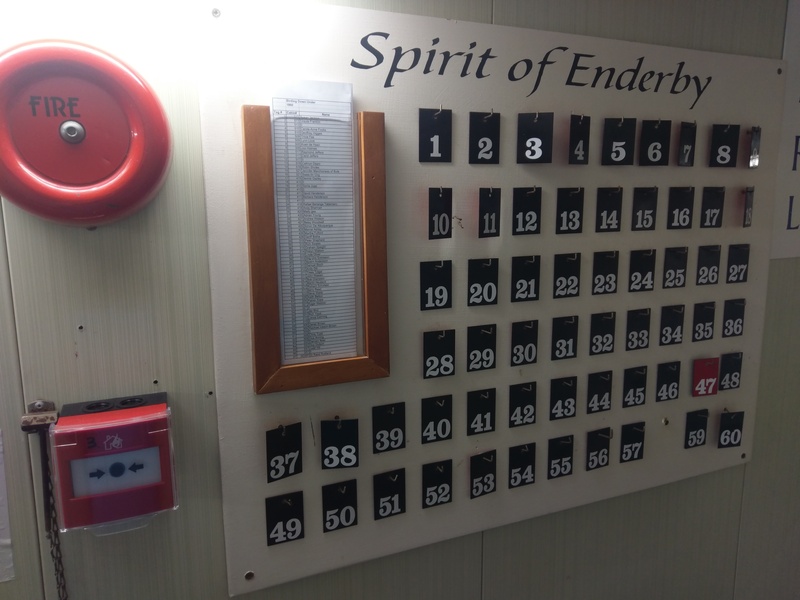 Called the Spirit of Enderby in an English-speaking context, she is ice-strengthened, not as much as a true ice-breaker but enough for her to be at home in polar conditions. 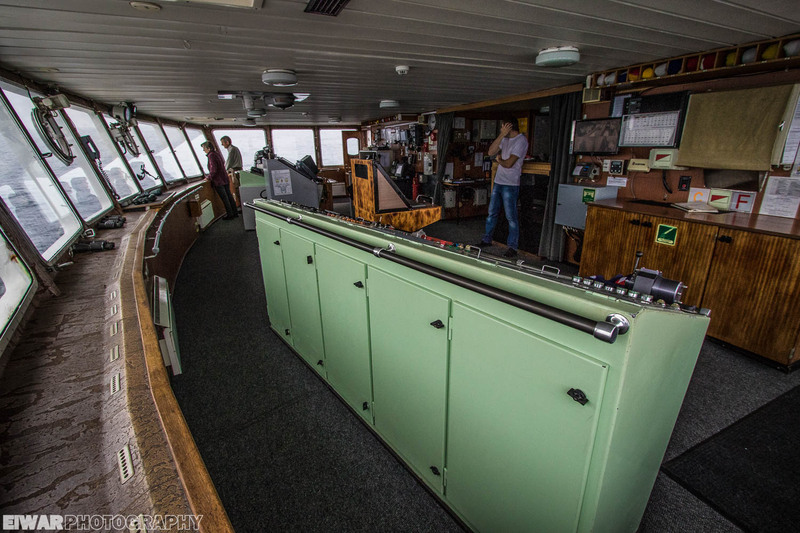 When running on two engines, she can reach 12 knots, but most of the times we used only one engine and sailed at 10 knots – however, after our detour to Stewart Island, we sailed at full speed to reach the Auckland Islands as soon as we could. 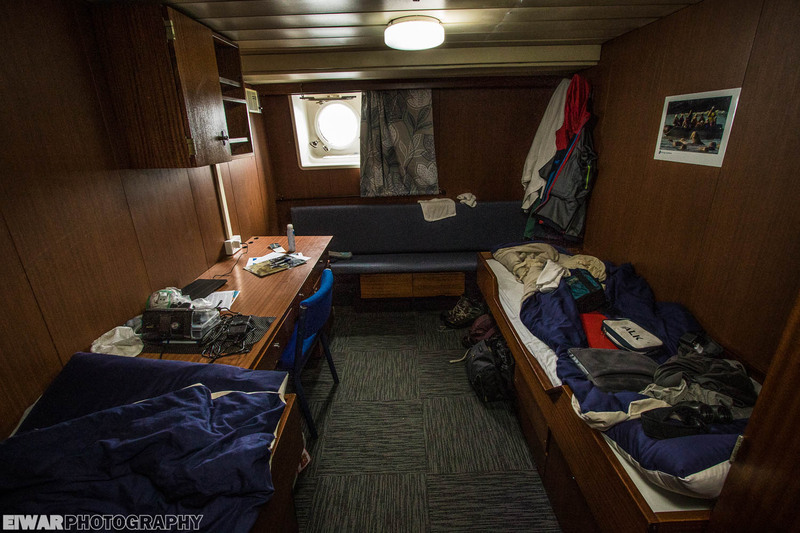 When I saw my cabin for the first time, I was astonished. I thought it would be much smaller! My cabinmate Andy and I both had a lower berth, there was a seating bench against the hull, a desk, a sink, several drawers each and two wardrobes (I didn’t use mine, I didn’t have enough belongings to need it :D). Toilets and showers were shared with other cabins, but for someone used to living in hostels and camping grounds, it was not a big change. 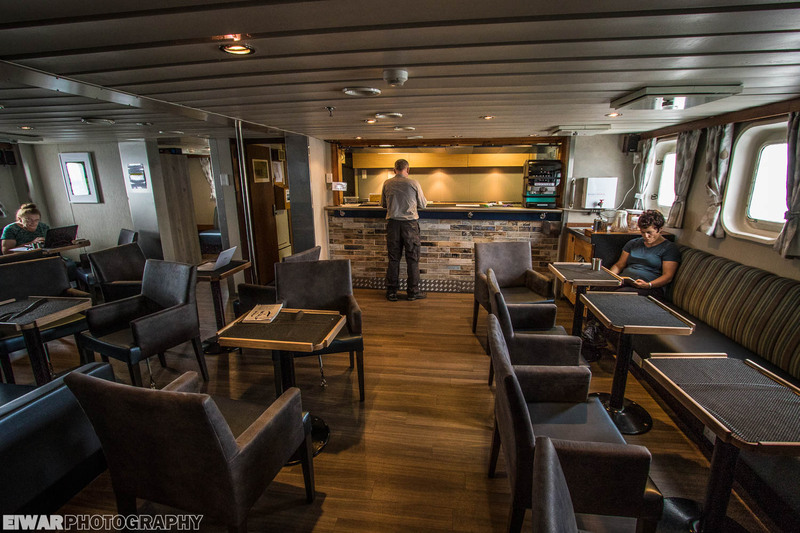 We had two chefs onboard to take well care of the food; some liked to complain about this and that (mushrooms, for instance), but I was more than happy with what we got, it felt like great luxury! In the first days, we had to get used to the swell and the consequent rolling of our ship, which would be our constant companions for the whole cruise. Some wore patches against seasickness, and I had pills to take. Even without really feeling sick, while seated and trying to swallow a meal, the biggest waves had a disturbing effect. Like a roller-coaster, except you don’t see where you’re going nor what’s coming next. It made me uneasy more than once. Lunch and dinner were delivered to our tables, but the breakfast buffet proved a dangerous moment. I don’t think too much was spilled, but it was always entertaining to see people stumble to their seats, a plate in one hand, the handrail in the other. One hand for yourself (or your food), one hand for the ship. It must be noted that, expect for one rough night as we approached Macquarie, we faced much calmer seas than I thought. Apparently, though, they don’t always face such a constant roll. No crashing through gigantic waves… am I really disappointed about that? I can’t decide. Good evening ladies and gentlemen, good evening. It’s 8 o’clock, dinner is ready to be served. Though we had a programme for the expedition, Judd, our expedition leader, always had to keep an eye on the weather, especially the wind, to see whether we could stick to it, or what arrangements could be made if not. As an example, the wind was blowing in the wrong direction at the Antipodes for the usual activities, forcing us to cruise along the other side, a shore never explored before! Because we were at the mercy of the elements, the PA (personal address) system was a lifeline for us not in the know. 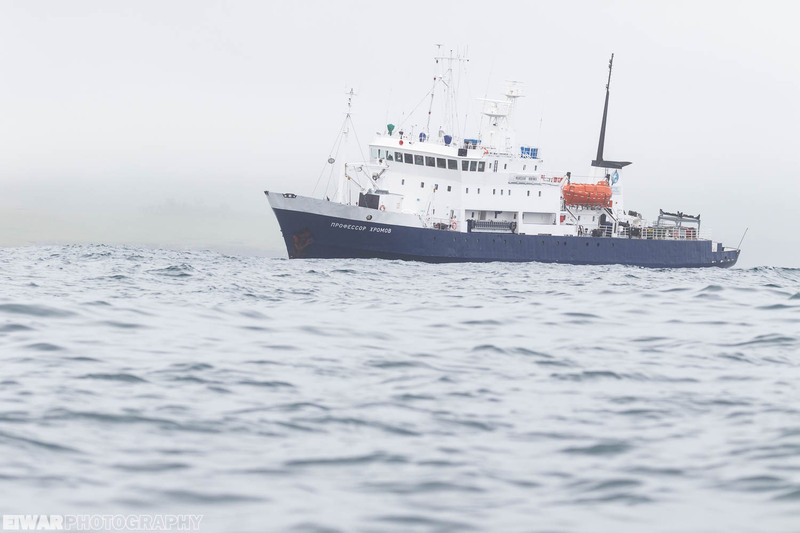 Through it, all we needed to know was announced: meals, lectures, whale sightings, landings… Even a wakeup call was given by Judd in the morning, his “Good morning good people” being the softest alarm I’ve ever heard. Our ship had a small lecture room at the bottom, and that’s where we gathered to receive some necessary briefings, about topics like safety on board or rules for landings. 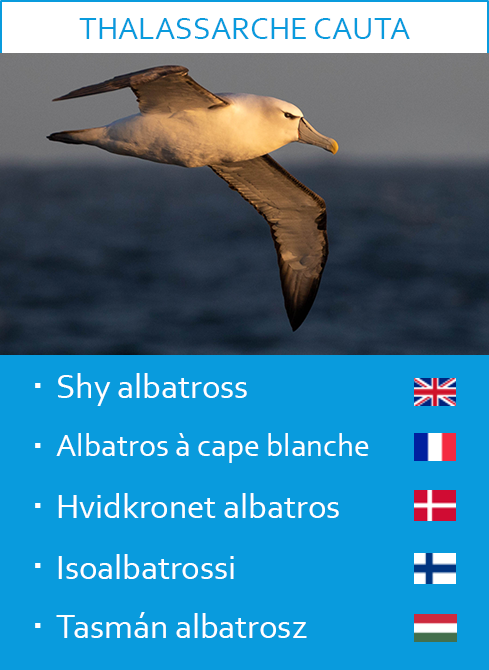 We also had informal lectures from our guides, about birds or cetacean identification but also history of some islands or flora. We even had a few movie times during quiet crossings. I didn’t attend everything, but I think it’s great to have these opportunities. 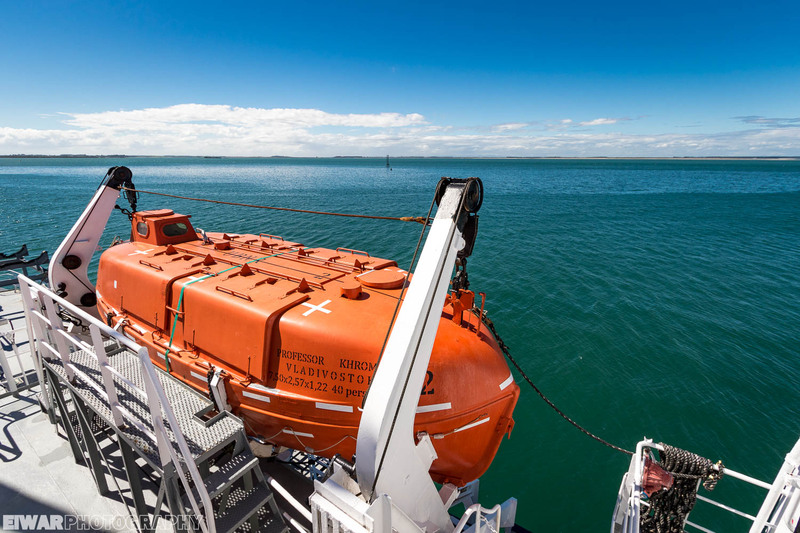 Speaking of safety onboard… before we departed Bluff, we had to do an evacuation drill. When the alarm rung, we went into the lifeboats, one on each side. Equipped with our life jackets, we sat tight next to each other, and then the sailor started the engine. We are supposed to be able to survive 7 days in this tin can, but I think the crowding and noise would drive everyone crazy long before that. 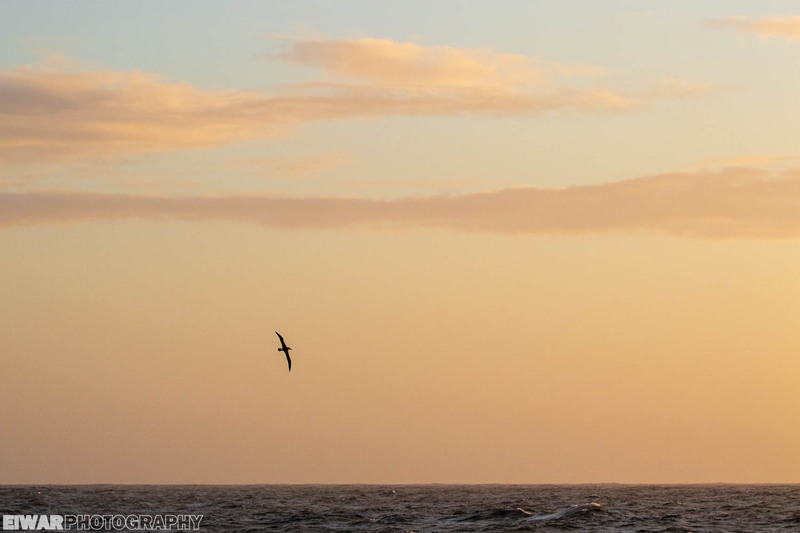 Many passengers were experienced birders, and I learnt a lot from them. I loved listening to them when they debated taxonomy or recalled field stories from a whole life of birdwatching around the world. 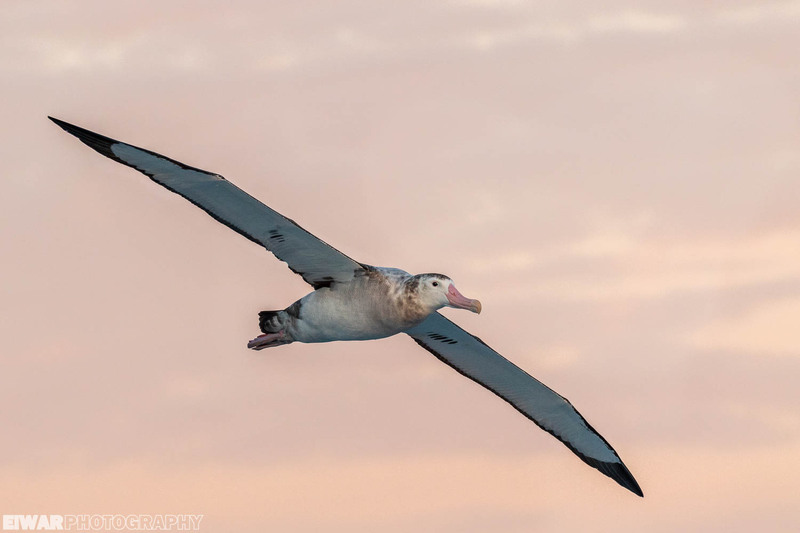 My main challenge in photographing these birds was that we often overlooked them as they glided over the surface of the ocean. I didn’t like the sea a background very much, and thus tried to go to the lower levels, to have at least the horizon in my shots. 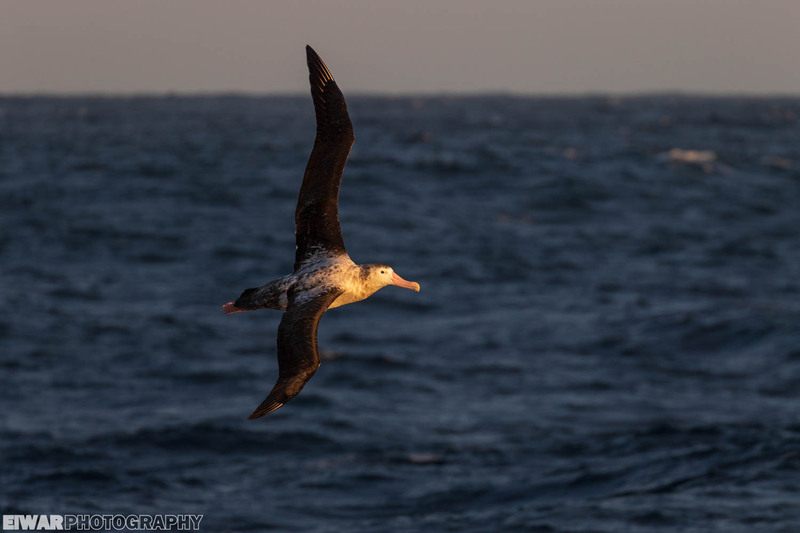 The other issue I had was that, after shooting the albatrosses times and again, most other birds were tiny and far away. 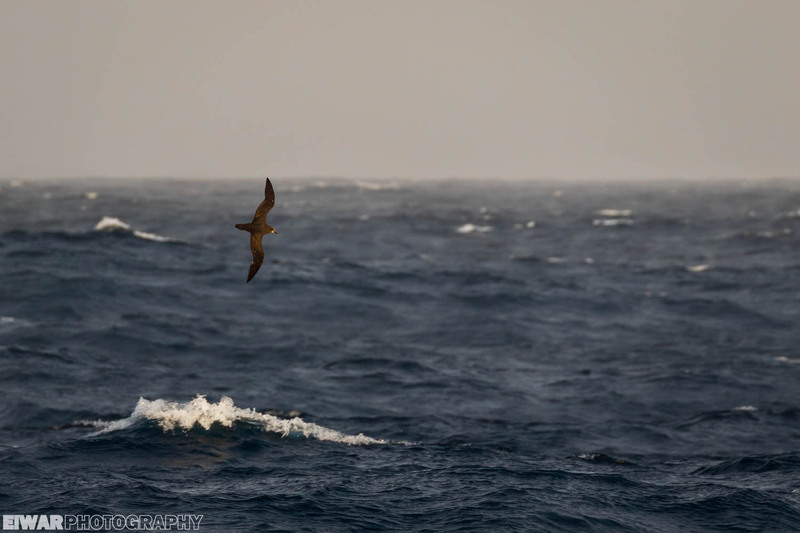 On a moving ship, it’s not that easy to keep a petrel in focus when it dives behind waves every now and then. 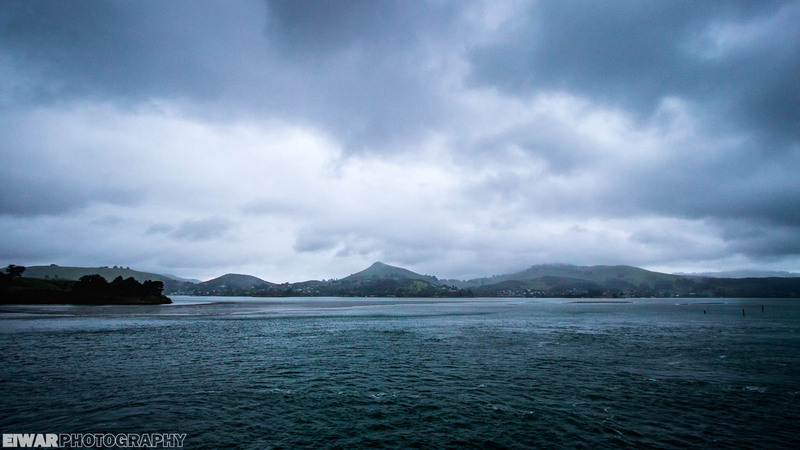 That led me towards small-in-the-frame images, but how make this immense body of water interesting enough? Also, how do I set my focus point to the right place, when they can turn around at any time? I wanted to have them enter the frame and look into it, rather than appear as if they wanted to escape it. 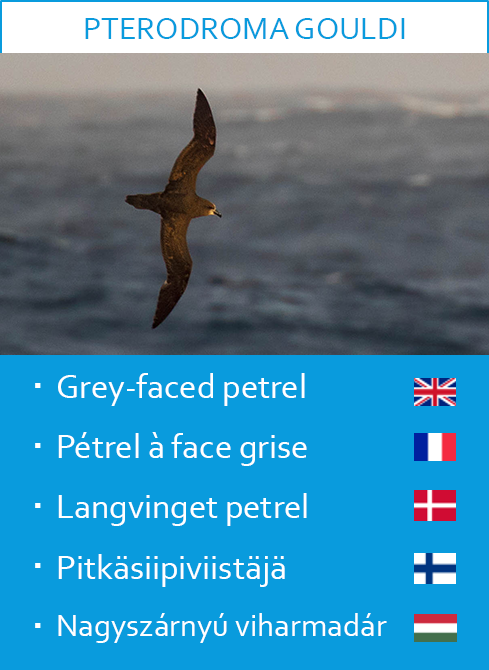 That was a fun challenge, and I think this next picture puts everything together, with the crashing wave below this Grey-faced petrel (Pterodroma gouldi) providing an interesting balancing feature. Another difficulty I noticed when shooting birds at a closer range was that it was all too easy to make pictures where they looked away, but much harder to click soon enough for them to lean a bit towards the photographer. 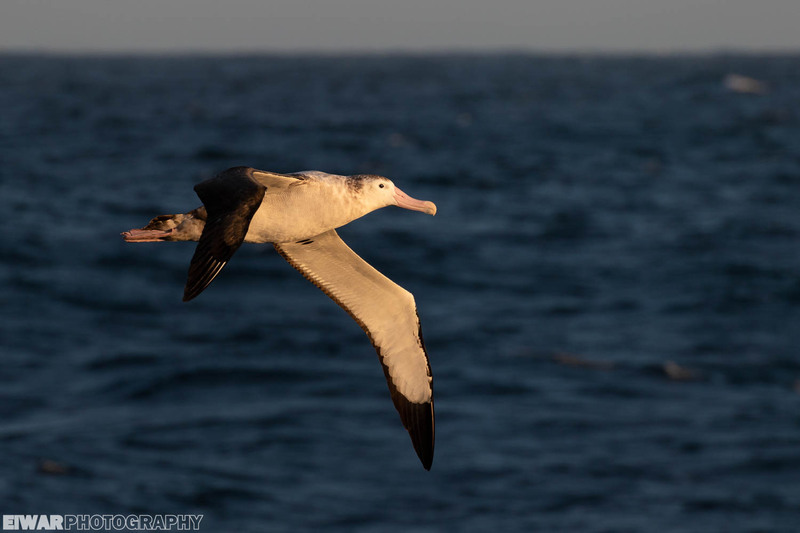 I would point my camera towards an incoming albatross, focus, and by the time I was ready to pull the trigger, it would be turning away, maybe slightly only but enough to make the shot worthless. Can you feel the difference between these two shots below? 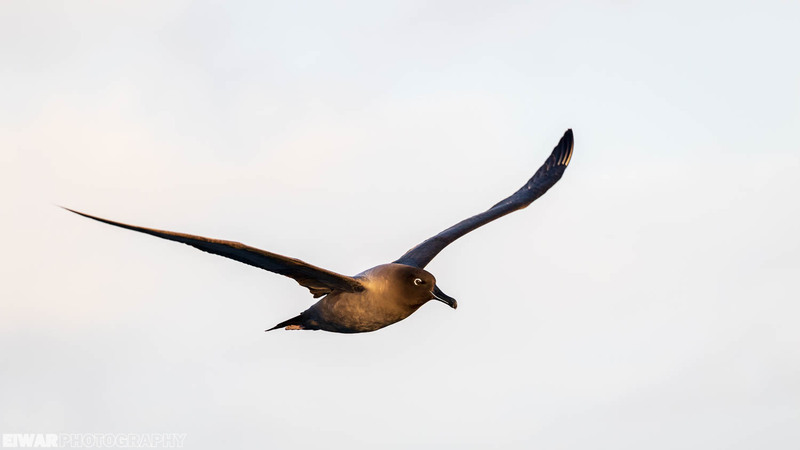 Eye-contact is primordial in wildlife photography, and seabirds are no exception 😊 Therefore, I put great effort in anticipating incoming birds to target them and shoot before they had turned away. 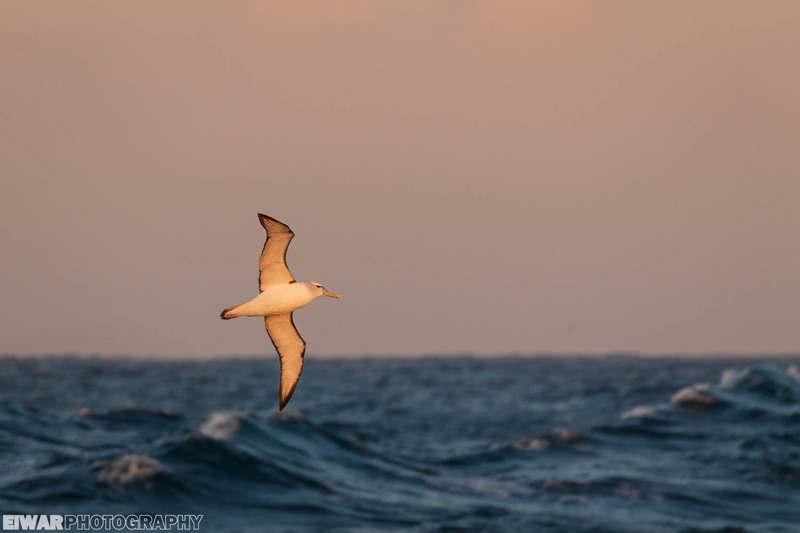 When we came into calmer seas, that meant land was close and we would get onto the zodiacs. That in itself was often an expedition, for we had to climb down the gangway along the side of the hull, where a zodiac would wait for us. But while the ship was rather stable, the inflatable dinghies remained vulnerable to any swell. While one stood on the last platform, waiting for the right opportunity to board, the zodiac could drop a meter in a hollow, or climb the same on the crest of a wave, with water flooding the poor passenger… hence the waterproof trousers! Finally, when the time was right, we would grab the sailor’s arm, step on the pontoon and then into the boat, and then stumble to sit on the side. On a wet rocking boat, it was not as easy at it sounds. Upon coming back, the reverse procedure was to be followed. Sometimes, we only cruised around the islands. Sometimes, we landed! Then, our driver would put the zodiac’s nose against the shore, be it sand, rock or something in between, and we’d have to throw our legs overboard and step out, often in the water. If it was the back of the zodiac to the shore, it would work exactly the same. Once on dry shore, we would all leave our life vests in a box. Upon departure, if one was left, we would know someone was still behind. The other way to ensure all came back was the tag. Before leaving the ship, we had to turn our tag to red, to show we were going out. Upon coming back, we had to turn it back to black, to show that we were safe on board. When landing, we also had to clean our boots before and after, to make sure we were not introducing any nasty organism to these fragile environments. These were procedures we had to follow every time, but oh how often did I lose my spot in the queue because I had forgotten to turn my tag! The bridge was open to everyone at any time, except when a pilot was onboard. It provided a safe (and warm!) 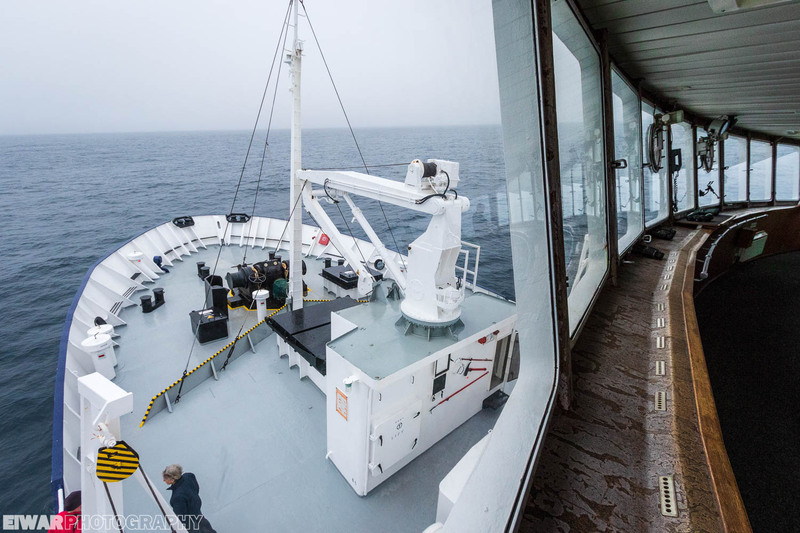 vantage point, and a unique opportunity to see how a crew operates on such a ship. That’s where we watch a pod of killer whales (Orcinus orca) swim past while fishing, along the shore of Macquarie Island. Thus ends my tale. It was an extraordinary trip, I saw things I had never dreamt of and enjoyed the enthusiastic atmosphere created by all these folks. 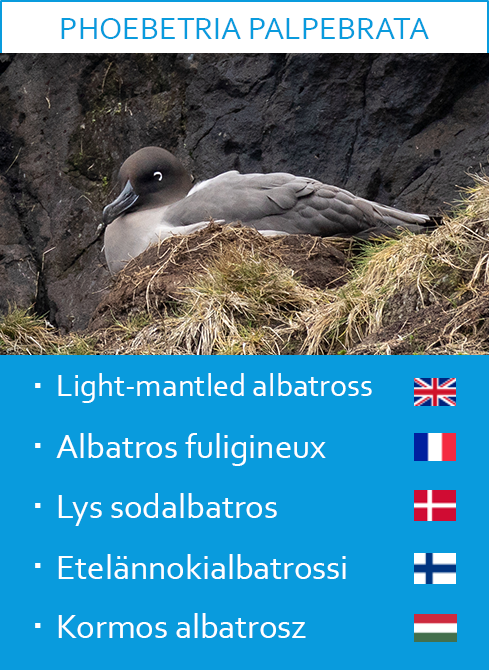 Subantarctica is the first project I’ve now presented on my website. I would love to bring it a tad further by giving talks or setting exhibitions up. If that is of interest to you, or if you want to publish this story, please contact me! 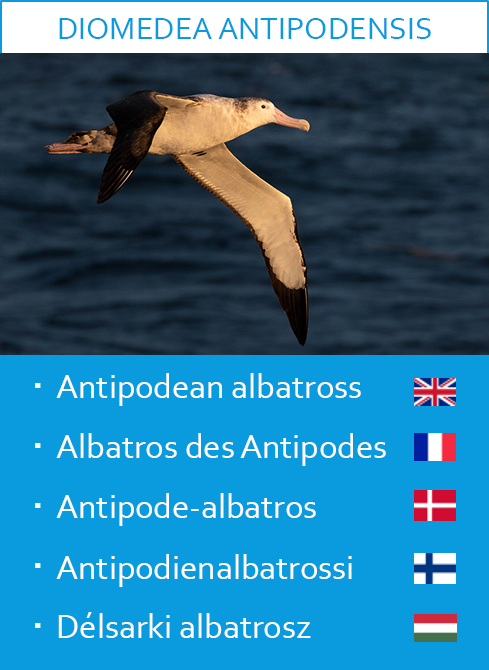 This entry was tagged New-Zealand, ship, Subantarctic. Bookmark the permalink. So glad we got a taste of this marvelous trip. Epic! Great trip! How long before you find a winch monkey /photographer position on an Australia bond sailboat?